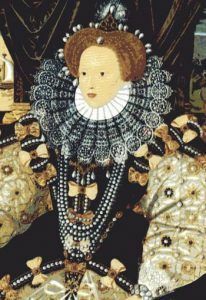 Citation: C N Trueman "Elizabeth I and Marriage"
From the start of her reign in 1558, Elizabeth I was pressurised into marriage so that there would be an heir to the throne. Even though Elizabeth was Queen, members of the Privy Council still felt that it was their right and duty to persuade Elizabeth that marriage was for the best of the nation. We do know that Elizabeth had a huge sense of duty to her country but whether she ever really intended to get married is open to debate. Many European rulers would have been very keen to marry Elizabeth for very good reasons. The most obvious candidate would have been Philip of Spain. He had been married to Elizabeth’s half-sister, Mary, and Spain was seen as a friendly nation in 1558. In London many in the Privy Council were fearful that France would rekindle her relationship with Scotland and that England would face threats on two fronts. However, this would not have been so much of an issue if England and Spain were united through marriage, as it would have been France who would have been between the two nations. If Scotland, aided by France had attacked England, Spain would attack France at her weaker southwestern border. This was the insurance that the Privy Council believed England would have if a marriage between Elizabeth and Philip occurred. However, the very idea of such a marriage between the two appalled many. Just as Elizabeth was pushing through a religious settlement that put Protestantism very much at the forefront in England and Wales, the very idea of marrying a staunch Roman Catholic was unacceptable to many. Second, Philip was a foreigner. The marriage between Mary and Philip had been unpopular among the people for this reason. The very idea that a foreigner might control England or that he might influence policy was also unacceptable to many. If Philip was an unacceptable choice, there were other European leaders who would have sort the hand of Elizabeth. Eric of Sweden was Protestant and a head of state in his own right. But while he may well have wanted to pursue Elizabeth, it was not reciprocated. Under Gustavus Adolphus, Sweden was to achieve greatness – but during the reign of Elizabeth, Sweden was still seen as a second-rate power and not a nation England would be linked with via marriage. If Elizabeth had a raft of reasons not to marry a foreigner regardless of religion, there were nobles in England whom she could have married. However, all these men would have been beneath Elizabeth in terms of social rank and it is quite possible that Elizabeth had determined not to marry ‘beneath her’. By not marrying Elizabeth failed to produce an heir. We do know that Elizabeth had a huge sense of duty to her people and country, so it must have been a very conscious decision made by Elizabeth not to marry. Negotiations were made with Philip of Spain, Archduke Ferdinand and Archduke Charles – all European and all Catholic. But there does not seem to be any evidence that Elizabeth was keen to marry and that she was merely going through the motions. It could be that her childhood experience of seeing her mother, Anne Boleyn, executed on the orders of her father had tainted her views on marriage. Four stepmothers may well have done the same. Her half-sister’s disastrous marriage could have hardly encouraged Elizabeth that marriage was for her. However, no marriage and no children raised the whole issue of the succession on her death.